All SHADY HILLS homes currently listed for sale in San Antonio as of 04/22/2019 are shown below. You can change the search criteria at any time by pressing the 'Change Search' button below. "WOW IT'S A PARK! 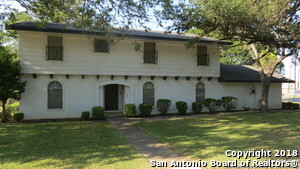 Almost 3/4 of an acre corner lot with a wonderful family home on it, centrally located with easy access to Hwy 281. Right across the street from Bradley Middle School. Well-kept vintage home with a great flow for entertaining and wonderful character, several built-in book cases and real wood cabinets and an intercom system. 4 generously-sized bedrooms, with the master down and generous closet space in all bedrooms to meet a family's storage needs. A/C compressor replaced on "